Traditional dentistry focuses mainly on oral hygiene, preventing, diagnosing and treating oral disease. In Thailand, we offer Cosmetic Dentistry Solutions that focuses on improving the appearance of a person’s teeth, mouth and smile. In other words restorative, general and/or family dental practices address dental problems that require necessary treatment, whereas cosmetic dentistry provides elective – or desired – treatments or services. Our Dentists may also provide restorative benefits. For example, dental fillings are a common procedure used to treat decayed teeth. Previously, most dental fillings were composed primarily of gold, amalgam and other materials that left visible dark spots on the teeth. Today dental fillings may fall into the category of cosmetic dentistry Thailand, because you can select fillings made of porcelain or composite materials that closely match the color of your teeth, thus maintaining the natural appearance of your teeth and smile. • Inlays/Onlays: Also known as indirect fillings, inlays and onlays made from porcelain or composite materials are a long-lasting yet cosmetic way to provide a “filling” to teeth with tooth decay or similar structural damage. Whereas dental fillings are molded into place within the mouth during a dental visit, inlays and onlays are created in a dental laboratory before being fitted and adhesive bonded into place by your dentist. • Composite Bonding: Chipped, broken, discolored or decayed teeth may be repaired or have their appearance corrected using a procedure called composite bonding. A dental composite material with the look of enamel and dentin is applied into the cavity or onto the surface of a tooth, where it is then sculpted into shape, contoured and hardened with a high-intensity light. Cosmetic Dentistry Thailand helps in the restoration that blends invisibly with the remainder of the surrounding tooth structure and the rest of your natural teeth to create a healthy, bright smile. 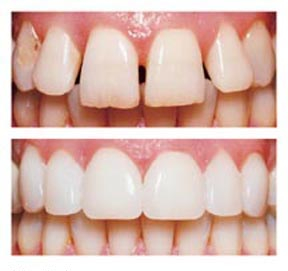 • Laser Teeth Whitening: Teeth whitening is perhaps the most commonly performed procedure. Teeth are often stained from smoking, food, drink (coffee, tea or red wine) or poor oral hygiene. Bleaching the teeth can enhance the appearance of your smile. worn appearance or severe tooth discoloration. Cosmetic Dentistry Thailand Veneers may also be recommended if you have gaps in your teeth or if you have not had success with teeth whitening. Clients are encouraged to evaluate the cost of getting porcelain veneer at home to determine whether dental insurance may offset the cost and eliminate the need to Travel to Thailand. • Dental Implants in Thailand: Implants are artificial tooth root replacements that are used as a part of prosthetic (artificial replacement) dentistry in order to compensate for tooth loss. Often the result is not only an enhanced smile, but also a more youthful appearance, since missing teeth cause the face to collapse, making you look older. • Smile Makeover: Smile makeovers involve a comprehensive assessment of your smile esthetics in order to improve its overall appearance. Typically one or more procedures are required for a smile makeover. Combining treatments such as veneers, implants, and teeth whitening can be combined in 1 trip to achieve the look you want. • Dry Mouth: Is your dry mouth temporary or a chronic problem? Cosmetic Dentistry Thailand can Help! •Full mouth reconstruction: While consulting with us about a smile makeover for esthetic appearance of your smile, your dentist may discover that there is a need to provide necessary treatment to correct functional problems with your bite, muscles, teeth and bone structure. If you need full mouth reconstruction, the costs and benefits of Cosmetic Dentistry Thailand make it possible for your dentist to provide you with durable, functional and clinically sound treatments with Cosmetic Dentistry Thailand that also look natural and are very easy on your bank accounts.